Legacy is a relatively large master-planned, gated community in North Bossier. Upon driving up to its majestic gate, you are greeted by a field of sunflowers standing guard to its beautiful estates and garden homes. This sets a tone for what is one of Bossier’s most charming communities. These primarily brick houses were built in the early 2000’s and offer residents a variety of floor plans and styles, sure to please the tastes of many. Being located on the North side of Bossier City, just off of Airline Drive, gives those who reside here some peace and quiet from the city, with the convenience of living only minutes from great restaurants and shopping centers. Being just a few minutes drive to I-220 also provides a way to quickly maneuver about the Shreveport-Bossier area with ease. I-220 stretches from the Harrah’s Louisiana Downs Racetrack all the way to connect with I-20, where it then continues on to become hwy 3132 connecting all of the way to Flournoy Lucas in South Shreveport. This gives access to Haughton, Benton Rd. Downtown Shreveport and the Louisiana Boardwalk, Cross Lake, and the Airport. Legacy is also very close to Cypress Black Bayou and all of its recreational opportunities. 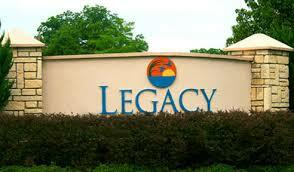 Legacy has it very own neighborhood pool, and recreational area. There are grills, tables, a playground, a fishing pond, and a large field for soccer and volleyball. With amenities like these, Legacy is a neighborhood offering more than most. For charming and peaceful living in North Bossier City, explore the homes in Legacy.